In the downtown of Guilin, water occupies big area. 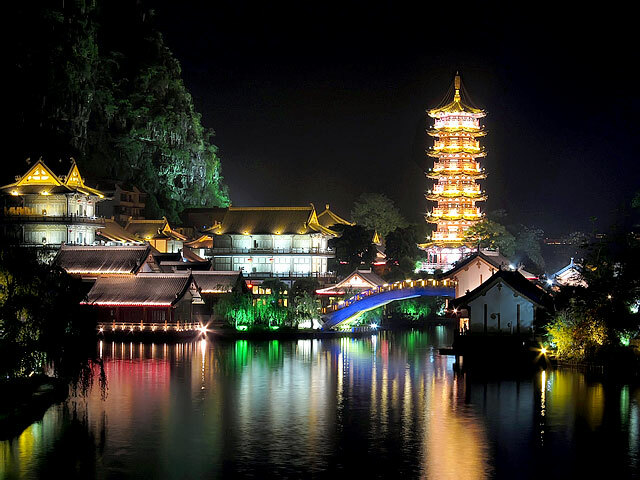 Guilin is regarded as a famous water city in China. The wonderful scene of the water city as described in the poem "A thousand hills stand around the city, a river flows through it" reappears. According to Chinese philosophy, the mountains are not live without water. Both the Limestone Mountains and clear water make up of Guilin scenery. Li River, Peach Blossoms River, Banyan Lake, Fir Lake, Osmanthus Lake and Mulong Lake are connected and liked up. The water in the four lakes is from the Li River and flows back to the Li River. The waterway transportation makes up of Guilin's central round-the-city water system, called "Two Rivers and Four Lakes". More than 1000 years ago, the locals built the four lakes surrounding the city and then the four lakes were served as a city moat. As Guilin expanded to the south, the moat became lakes within the city area. Right now, these four lakes serves as a big free public park. It is a place for the local people to relax. Those people who are living nearby always come to the lakeside and do their exercises in the morning and dancing in the evening. Every night when it’s getting dark, all the colorful lights prepared on the waterside and on the hills are turned on. They make the city of Guilin more colorful and dreamlike. Tourists can choose to walk along the lakes or take the local electric boat to have a one-hour cruise on the four lakes.